In a saucepan, bring the broth and fennel to a boil. Cover, reduce the heat and simmer until the fennel is tender, about 10 minutes. Drain, reserving the cooking liquid for another use (soup, mashed potatoes, etc.). Refrigerate the fennel until fully cooled, about 30 minutes. In a food processor, purée the fennel with the monkfish and egg. If needed, add 15 to 30 ml (1 to 2 tablespoons) reserved cooking liquid. The fish purée should be smooth, but thick enough to hold its shape. Season with salt and pepper. With the rack in the middle position, preheat the oven to 200°C (400°F). Line a baking sheet with parchment paper. On a clean cutting board, butterfly the salmon fillet: Place a hand on top of the fillet and, with a very sharp knife, slice the fish along the side through the thickest part without separating it completely. Open the fillet like a book. Season with salt and pepper, and transfer to the baking sheet. Spoon the stuffing evenly over one side of the salmon fillet and close. Season with salt and pepper. 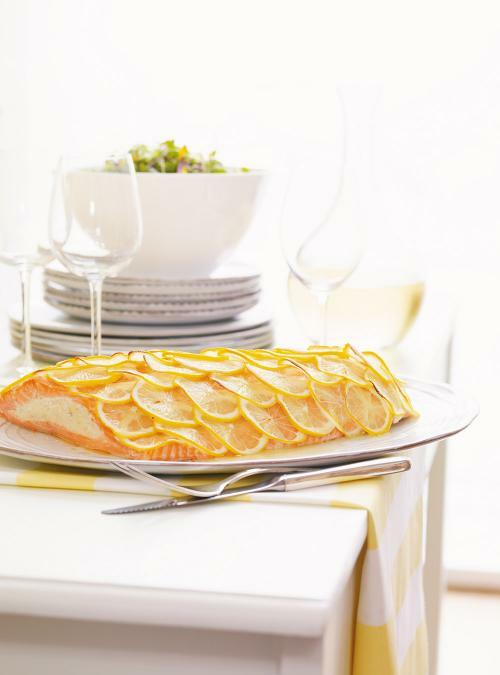 Cover the salmon with lemon slices overlapped to resemble fish scales. Bake for 35 to 40 minutes. Cover and let rest for 5 minutes. 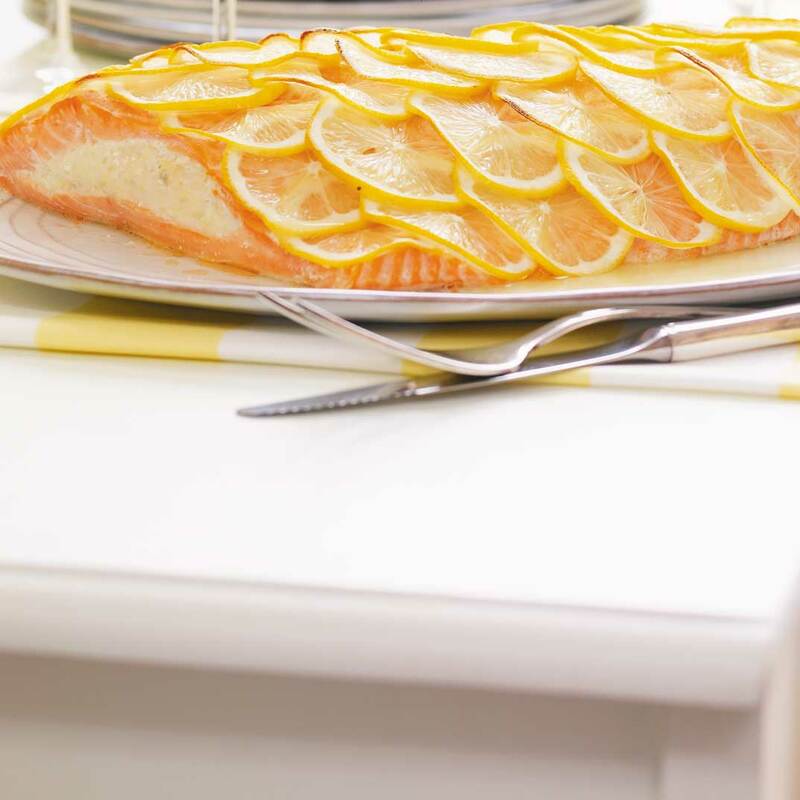 Using two large spatulas, gently slide the salmon onto a serving plate. Remove the lemon slices before serving. 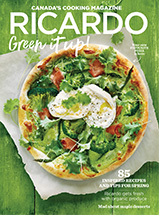 Prepare this while the salmon is cooking. In a small skillet over medium-high heat, brown the lemon in the oil until caramelized, about 3 minutes per side. Refrigerate for 5 minutes and chop finely. In a small bowl, whisk together the lemon with the water, mustard, egg yolk and fennel seeds. Whisking constantly, add the oil in a thin stream. Season with salt and pepper.